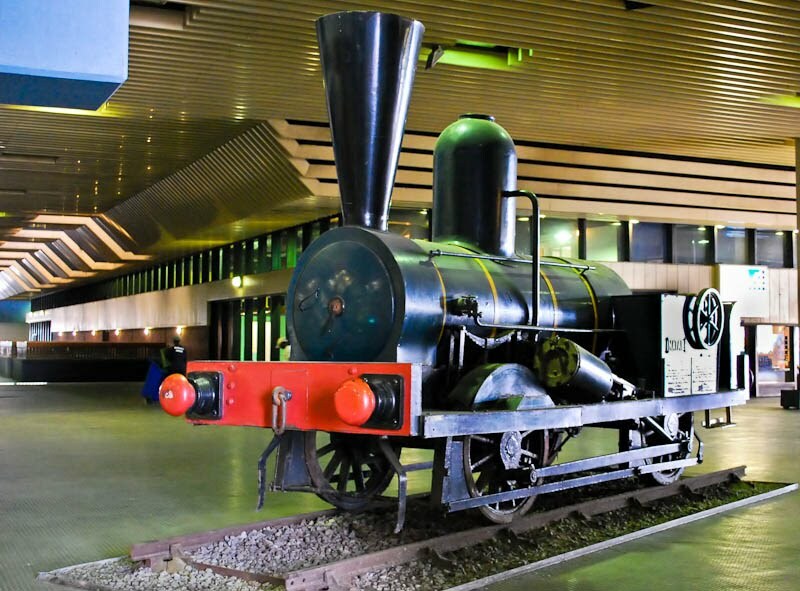 The first steam locomotive to arrive in South Africa, in 1859, was "Blackie", which was displayed to the public in Cape Town, while construction of the line, on which it was to run, was still in progress. 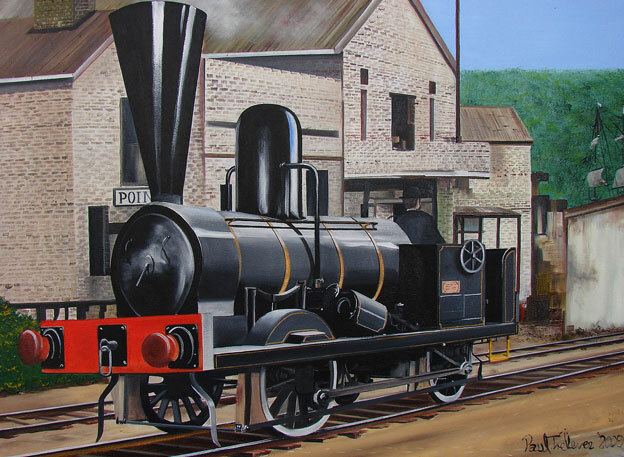 However, "Blackie" was NOT the first locomotive to head a public train in South Africa. 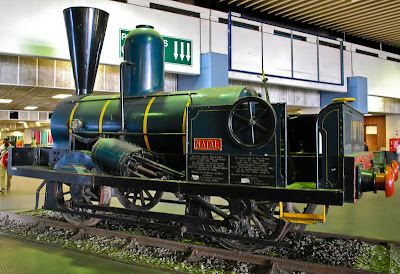 In 1860, the "NATAL" locomotive arrived after "Blackie", in Durban (South Africa), BUT the "NATAL" was the first steam locomotive in South Africa to haul a public train, albeit on a very short line of two miles, between Point Station and Durban Station. Copy of the above newspaper article kindly provided by Kris Ward who also wrote a brief history of the "Sun Foundry" in Leeds, which later came to be Carrett Marshall & Company. One of a series of photos of the "NATAL", as plinthed in the Durban station building, taken on May 5th, 2009 by (c) Alan Wilson after a request by Boon Boonzaaier to Ashley Peter. The 3 photos here were kindly provided by Boon for use in this entry. The photos were taken to aid with the design of one of the stamps in a special 2010 issue (10 stamps) to mark the 150th anniversary of the first train trip in South Africa. More information on these stamps are here. For many years it was believed that the "Natal" was built by "Robert Legg" at the "City of London Engine Works." 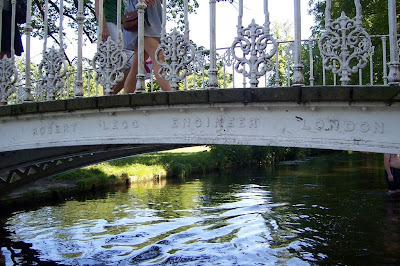 This cast-iron bridge over River Wandle in Morden Hall Park carries the id "ROBERT LEGG ENGINEER, LONDON"
In 2009 John N Middleton, compiler of the "Railways of Southern Africa - Locomotive Guide 2002" kindly provided the latest thinking on the builder of the NATAL: "The NATAL was always attributed to Robert Legg, but recent research has shown, that he was only an agent, and the loco was actually built by Carrett Marshall & Co, at their Sun Foundry in Dewsbury Road, Leeds. The 'City of London Engine Works' was, I think, typical of grandiose 19th Century exaggeration, as the address for Robert Legg, in contemporary trade directories, was just an office building !! " In 2009, Robert Legg, the great grandson of the above mentioned Robert Legg, has this background: "Robert Legg Ltd was founded, as a general engineering company, in London, in 1849, by my great grandfather, who was by training a black smith, and had moved to London. There are photographs of a beam engine, and cast iron bridge (still standing) , both of which bear his name. The firm got involved in the primary tobacco industry during the 1870’s, manufacturing presses and cutters. The reason why I needed the date of the Natal, was to establish how long Robert Legg’s had been running, ie about 10 years, so I would think it probable that he was acting as an agent in this case, however I would like to think the address of the "City of London Engine Works" was in fact a medium manufacturing engineering concern, and not what you say." (above in this blog entry). In 1858 this firm took over from Charles Todd who, after leaving Shepherd & Todd, had set up his own factory. Carrett Marshall & Company may have built a few locomotives but little is known about this side of their activities. They were mainly known for their remarkable steam driven road vehicles. Mr Carrett had left E. B. Wilson & Company to join Marshall as a partner in the new firm. Many engineering articles were manufactured including water pumps and tanks. An advertisement in the Colliery Guardian shows a drawing of a four-coupled saddle tank, with inclined outside cylinders fixed immediately behind the leading wheels. One locomotive is reported to have been built in 1860 for the Natal Railway and named Natal, and others for the Kendal & Windermere Railway. Also showed interest in supplying to Festiniog Railway. 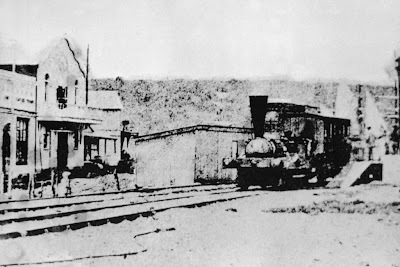 This Durban Local History Museum photo, from around 1869, shows the "NATAL" at the Durban Point station. Note the passenger carriage in tow. Official opening of the railway. Image courtesy Natalia 40 published Dec 2010. Image courtesy Natalia 40 published Dec 2010. The original locomotive, which was formally put into use on June 26, 1860, is to-day standing at the main station at Durban, after having been lost for many years and recovered in sections near Port St. Johns. One of a series of photos of the "NATAL", as plinthed in the Durban Station building, taken on May 5th, 2009 by (c) Alan Wilson. "Since Facts About Durban (1st Ed.) was published I have discovered that the Natal locomotive is on show on Durban Station and was recreated using many of the original parts which, according to a sign, had been found in the Umzimvubu River. The Umzimvubu runs into the Indian Ocean at Port St Johns about 240km south of Durban. There has never been a railway line in that area to my knowledge and so, of course, I immediately began to wonder what Natal had been doing there." "Without further ado I fired off an e-mail query to Transnet Heritage Foundation Librarian Eurika Deminey who faxed me a copy of an interesting booklet on the Natal engine which was written by Theo J. Espitalier and published in 1944 at two shillings per copy. It seems that the Natal ran on tracks which were four feet and eight inches apart and that it could no longer be used after the Natal Government decided in 1875 to move to tracks which were only three feet and six inches apart." "The Natal was sold in 1879 to Mr Crowther who had the idea of using it to power a sawmill on his farm which was about four miles up the Umzimvubu River from Port St Johns. The engine was dismantled and shipped to the farm on the ketch Sir Evelyn Wood but it wasn't ever used because the farm labourers objected. The pieces of the locomotive were eventually buried near the river which then deposited silt over the top of everything." "And there the Natal sat until 1943 when Espitalier was given the job of writing a history of it and managed to locate and photograph its remains. It was then decided to recover and restore the Natal and Espitalier was one of the small team which was sent down to Port St. Johns to do the recovery. The Natal returned to Durban on a 10-ton lorry on 26 June 1944 exactly 84 years after it had drawn the first train in South Africa." Drawing of the "Natal", made by TJ Espitalier, and published in the SAR&H Magazine in June 1943. 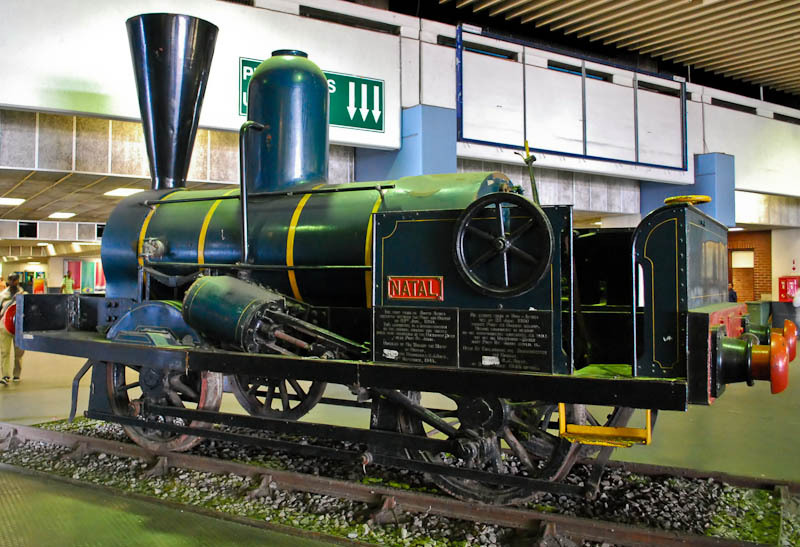 At the time, Espitalier, a draughtsman in the offices of the Chief Mechanical Engineeer, was involved with the recovery of the "Natal", which hauled the first public train in South Africa in 1860. 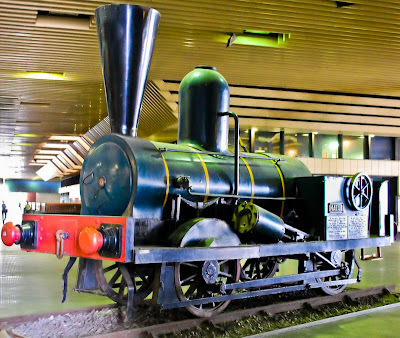 The task of restoring the old locomotive in the SAR workshops then commenced and eventually the shining "new" locomotive could be shown to the public. In 2010 there will be a special postage stamp issue to mark the 150th anniversary of the first train trip in South Africa – one of these stamps will picture the “Natal”. 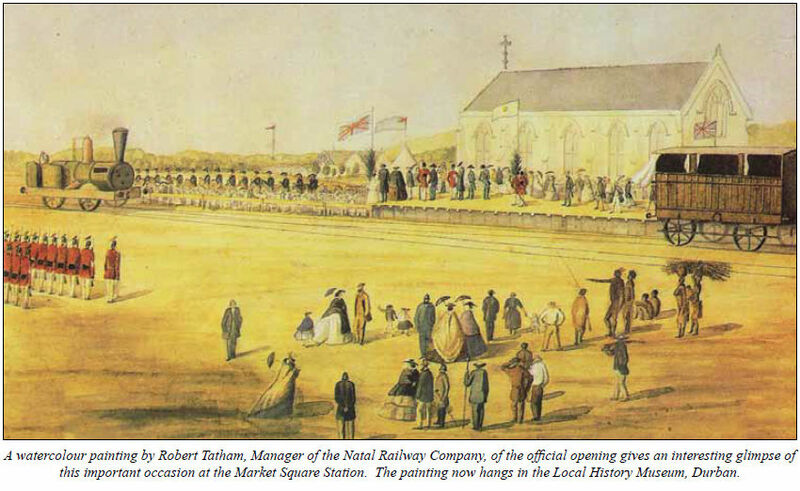 The fact that the building of railways was being seriously considered in Natal first emerged on 20th January, 1859, when Mr. Albert Robinson, an eminent Civil Engineer from England, announced that he had completed a plan for a proposed line from the Point, near the Custom House, to the Market Square Ordnance Reserve in Durban, and for the line to be worked with steam locomotive power. 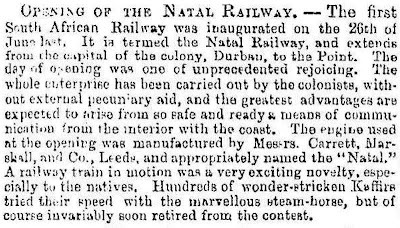 The Natal Railway Company was formed on 1st March, 1859, with capital amounting to £10,000. 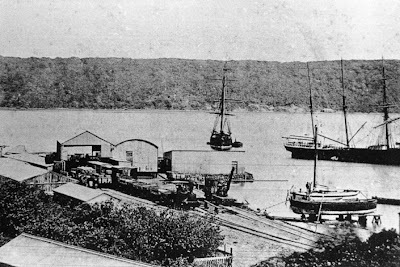 The Natal Legislative Council passed the Natal Railway Company Law without much delay, giving powers to the new company to construct and maintain a railway between the Point and Durban. "Under the energetic superintendence of Mr. Latham, Secretary and Manager, this work is rapidly progressing towards completion. 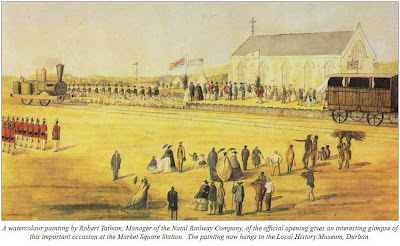 The line is already laid for half the distance, and in a fortnight, if circumstances continue favourable, the rails will have been laid up to the final termination near St. Paul's Church. Six or eight trucks and two traveling cranes are already mounted and in use. The locomotive is in the Cadiz, so that all the materials will soon be received." 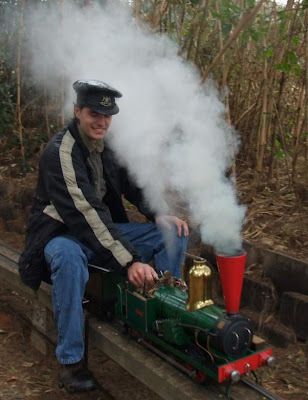 On 13th May, the brig Cadiz landed the locomotive, and the fitting up of the engine was entrusted to the Chief Engineer, Mr. Henry Jacobs, who combined in his own person the duties of Locomotive Superintendent, Fitter and Driver. He was assisted by Alexander Davidson, who was Chief Smith, Fitter, Spring Maker and head of the repair shop, and whose duties also included a little plate laying. It is recorded that they were both skilled and reliable men and made their own time, which averaged about twelve hours daily (Sundays off). They were, however, not extravagantly paid. A smart young seaman named Austin, was taken on as Cleaner and Greaser and, under Mr. Jacob's special training, was ultimately promoted Stoker. The engine was constructed, polished and painted, the body being green, the wheels copper coloured, and its name - " Natal "- was proudly announced on a burnished brass plate. It had a wheel arrangement of 2-4-0, and was officially described as being "about 24 horse power." The chimney was of inverted conical shape, the wide opening of which was covered by wire mesh to retain sparks or fragments of wood-fuel. 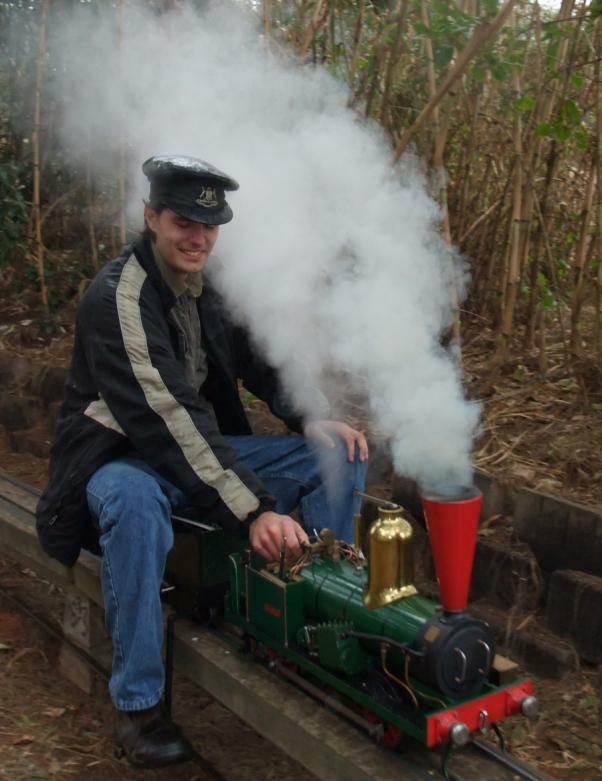 Surely this was the first locomotive spark-arrester used in South Africa. This little engine carried a small water tank underneath the coal bunker and footplate. A small donkey engine feed pump was attached to the bunker. 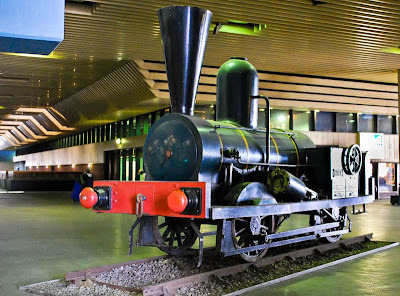 The "Natal" engine was therefore the first locomotive to haul a public train in South Africa on 26th June, 1860, operating over a distance of approximately two miles, between the Point and Market Square stations. "The march of the locomotive is the march of progress. Before the approach of the Steam Horse , all retrogressive influences vanish and give way Wherever the mighty engine secures a footing, civilization inevitably follows and enterprise of every kind fructifies and spreads." Although giving satisfactory service for several years, great difficulty was experienced with the sandy conditions of the track. Dust and beach sand constantly damaged the working parts and gear, resulting in frequent delays. The "Natal" engine was subsequently sent to Port St. Johns for use on the harbour works. Financially, the initial years of the Natal Railway Company were very difficult. For example in 1868, a Mr. Andrede was responsible for the management of the line, and combined in himself the offices of General Manager, Accountant, Secretary, and Debt Collector. Curious and interesting letters existed, amongst them some from the then General Manager, Mr. Andrede, apologizing for not being able to pay salaries in full; others enclosing a sum on account of salary, together with the interesting information that "the General Manager was going out collecting debts next week, and would forward the balance as soon as it come in." Other officials, instead of money payments, obtained orders from the Head Office on local grocers and such like, for "goods on account, per Railway contra." Another comical episode is on record, to the effect that the two little engines then on the line being out of gear at the same time, extra native labour was applied for by the General Manager, in order to push the trains by hand from the Point to Durban. After 1872, the Natal Railway Company steadily made profits, and in 1874, the line was extended to the Umgeni River, about four miles from Durban. Owing to the increased traffic over this section of the line, it was deemed necessary to import a more powerful engine, and Kitson & Co., of Leeds, supplied a side tank engine for the 4 ft. 8j in. gauge during 1875. 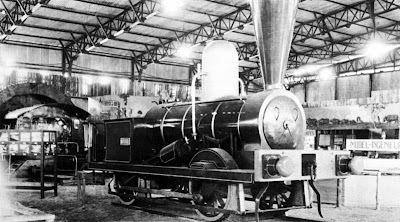 This engine was given the name "Perseverance," probably being named after the horse-drawn bus which operated between Pietermaritzburg and Durban during the early 'sixties. 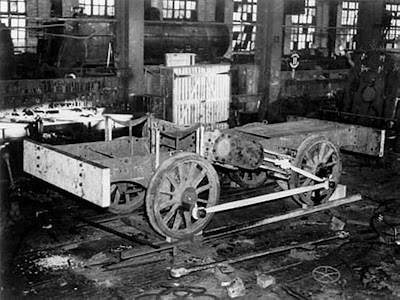 The wheel arrangement was 4-4-0, the four-wheel leading bogie being one of the first to be put into service in South Africa. The diameter of the coupled wheels was 4 ft. 6 in. The cylinders were fitted outside the frame and were 14 in. diameter by 20 in. stroke. The boiler pressure was 120 lb. per square inch. An interesting feature of this small engine was that the feed water pumps were attached to the back of the spectacle plates and were operated from the the piston crossheads. Wooden brake blocks, operated by a hand brake on the driver's side in the cab, were provided. The lubrication of the cylinders was by gravitation from two tallow "cups" fitted to the sides of the smoke-box immediately above the steam chests. 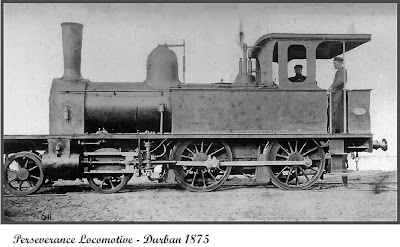 It is recorded that the "Perseverance" engine was later converted into a stationary engine and used for driving machinery and plant in the Durban railway workshops, being finally scrapped about 1887. The Natal Railway Company was established in Durban, and operated as a private railway, until it closed on 1 July 1976. This was as result of the Natal government's decision to purchase the small railway line, that ran between Point, Durban and Umgeni. "We are happy to announce that a project is on foot, under the auspices of an eminent practical engineer, at present in the Colony, for constructing a railway, with locomotive steam power, between the Point and the town, through the bush and along the principal street thoroughfares. The great width of our streets renders this practicable without injury to general traffic. We believe it is intended to form a company for this undertaking". 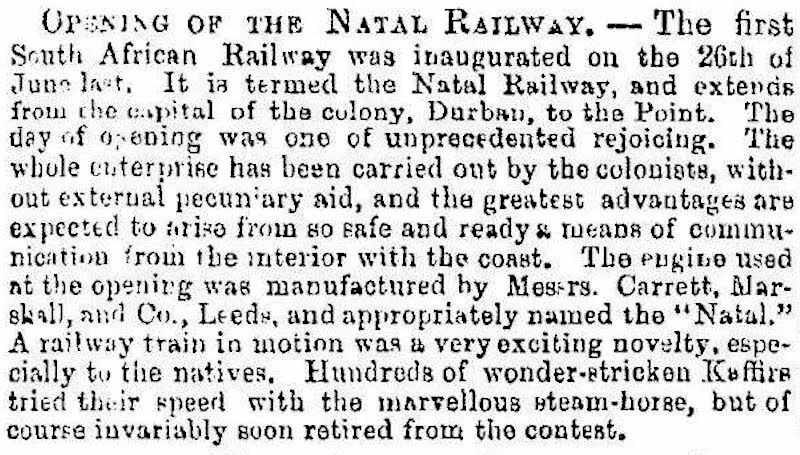 Within a fortnight the "Natal Railway Company" had issued its prospectus, and on February 3, 1859, the Natal Mercury published the news that Durban alone had subscribed nearly half the capital. In scale the project was much smaller than the Cape Town- Wellington line, for the route was barely two miles in length. Dividends, however, promised to be on the generous scale of 30 per cent. per annum. "This railway and the other operations contemplated by the company, are the more essential now that a steam tug is to be placed on the station, which, whilst obviating a recurrence of the frequent detention of vessels, will combine, when the jetty is completed, to make the harbour the most efficient in South Africa, and bring a large amount of passing tonnage to the port, Natal being directly on the route from India. It is contemplated eventually to extend the line beyond Congella to the Umhlatuzana, whence stone for the harbour improvements can be procured, where wagons to and from Pietermaritzburg can be loaded, avoiding the whole of the heavy pull through the Berea sand, and where the growing sugar estates near the Isipingo, Umlazi, and beyond, promise a large amount of traffic. There is not a member of the cornmunity but will benefit either directly or indirectly by the opening up of railway communication in Natal, of which this is but the forerunner." On February 28, 1859, representatives of the capital, Pietermaritzburg, were added to the Board, namely Jonas Bergtheil, J. Henderson and C. Behrens, and it was reported that "the line of the railway is already staked off and active operations are proceeding". By December 1, the news was that the material for the line was on the way, "so that if the directors do not still further cause delay by a bootless pertinacity respecting the site of a terminus, the railway will be opened for traffic early in the year". Four months later there was fresh and gratifying news. "Under the energetic superintendence of Mr. Tatham", wrote the Natal Mercury of April 12, "aided by the co-operation of the Chairman, this work is rapidly progressing towards completion. The line is already laid half the distance and in a fortnight, if circumstances continue favourable, the rails will have been laid up to the final termination near the church. . ." "Six or eight trucks and two travelling cranes are already mounted and in use. The locomotive is in the "Cadiz", so that all the materials will soon be received". 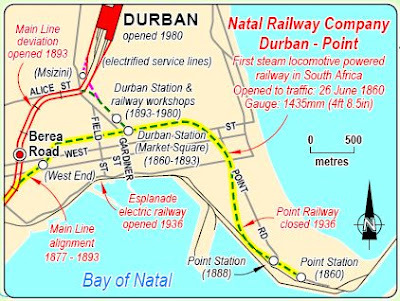 Map of the Durban Point line, the first active public railway line in South Africa. The Map was drawn by Bruno Martin in 2005, and may be found on here on sa-transport. July 2nd. Commenced receiving and delivering goods. 23rd. Cold, drizzling day. Strong S.W. wind. 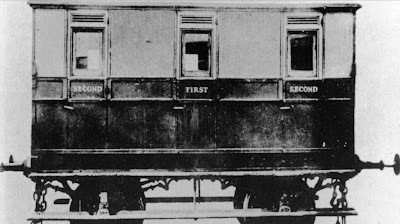 Expected Jacobs would not run the train, but he did, and earned eleven shillings with passengers. 25th. A great railway event to-day. For the first time trucks came up from the Point - empty, with news that the Point was "cleaned out". Basil Palmer's Natal II in 5" gauge - photo by Andries Keyser - more photos and report here on Sandstone website. The Locomotive in South Africa - by TJ Espitalier & WAJ Day reprinted from SAR Magazine 1943-1948. 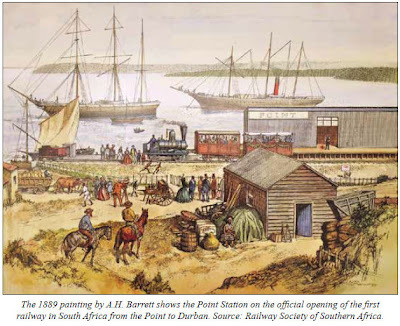 A CENTURY OF TRANSPORT - 1860-1960 (A Record of achievement of the South African Rail, Road, Air and Harbour Services) - A. Van Lingen. The COLONY of NATAL - An official Illustrated Handbook and Railway Guide by J. Forsyth Ingram - 1895. Railway Wonders of the World - by FA Talbot. Natalia 40 published Dec 2010 by the Natal Society Foundation. South African "Natal" 0-4-0WT Wikipedia entry. Very nice blog! Thanks. I grew up in Durban in the 60s. A railway station was sometimes the only island of modernity in the vast plains of the west and to this day the image of a log cabin Old West Small Train Station is representative of the days when the West was won.